Having completed Harry Potter and the Chamber of Secrets it seemed almost a matter of days before the challenge facing us was how to follow it up with the next Harry Potter video game – Harry Potter and the Prisoner of Azkaban. The requirement was to create a sequel that felt like a logical continuation of the established series but with enough new features that it would become a different adventure with a feel of its own. The first decision made was to make more use of Harry’s friends, Ron and Hermione. In Chamber of Secrets, they had been realised as relatively simple AI characters that lead you around Hogwarts according to preset paths. 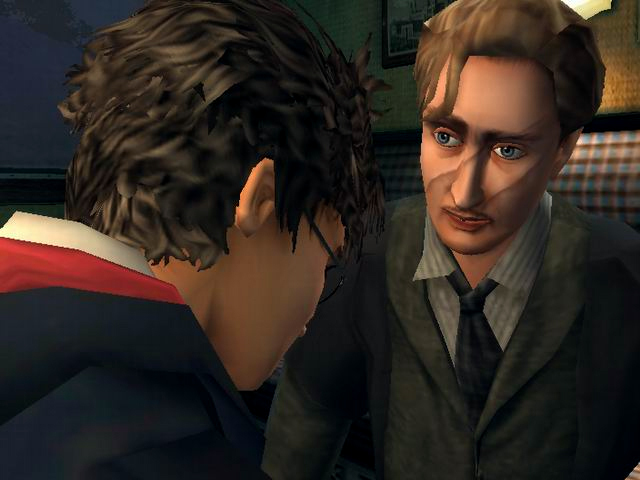 In Prisoner of Azkaban however, the intention was to take this to the next level with all three characters becoming playable and the player being able to switch between them at any time. In games prior to this, Harry and his friends were ‘the video game versions’ of the characters. With Prisoner of Azkaban, the team was allowed to model and dress the characters so they were closer to the movies. 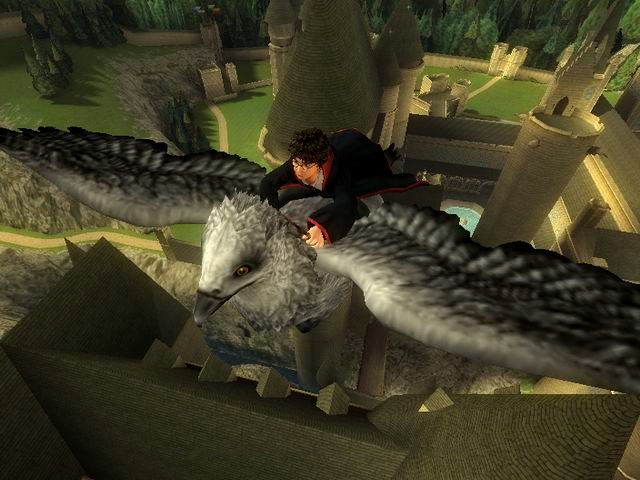 In addition to all of this character-switching gameplay, a number of other features were added – the ability to control Harry’s owl, Hedwig (and the ability to train an owl on the Gameboy version of the game and bring it across to the Nintendo GameCube to fly it) the inclusion of Buckbeak, the Hippogriff, as well as a series of Potter-themed Eye Toy games that were created by designer Matt Birch and his small band of art and coding wizards. 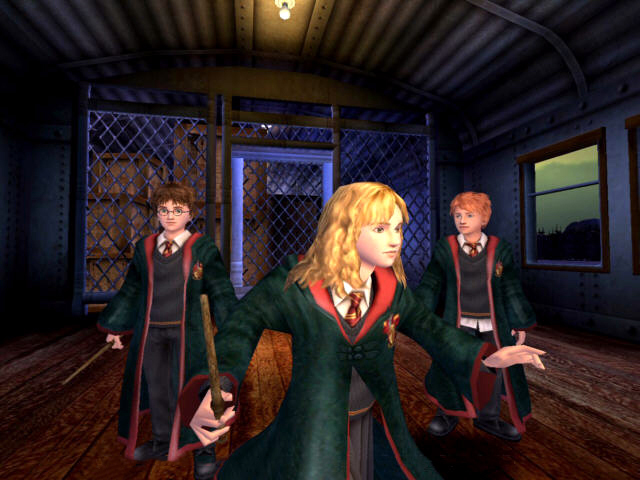 It was also an opportunity to add a number of features that never made the cut in Chamber of Secrets: duelling between the pupils, on-going Potions homework tasks set by Professor Snape to encourage players to explore the world with even greater purpose and the opportunity to go head-to-head a number of times with Peeves the Poltergeist. Peeves is a character that has never made it to the movies, but he works perfectly as a way of providing a mischievous interlude when sneaking around the corridors of Hogwarts. 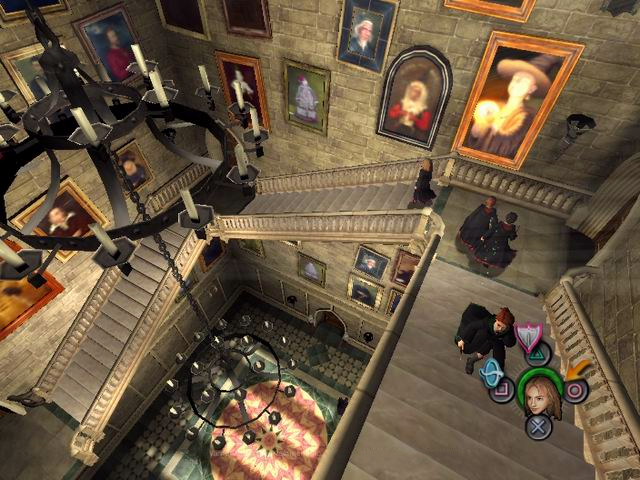 The Grand Staircase in all our games had to be functional as well as look cool. As the game design was formulated we realised not only that there was power in being able to have a group of characters working together but also in being able to isolate those characters from each other. This meant that the player would be presented with situations that would play differently depending upon which of the characters were together at any given time. This resulted in the game having an interesting ebb and flow, with Harry, Ron and Hermione being together in certain situations and then being split up either on their own or in pairs. Interesting scenarios could then be played out, for example, engineering it so that Ron would inadvertently trap Harry in a level and then seeing what would happen when he and Hermione were left alone to solve a puzzle together. Of course, true to character Hermione and Ron would bicker while being forced to cooperate to solve a puzzle if they were ever to save Harry. 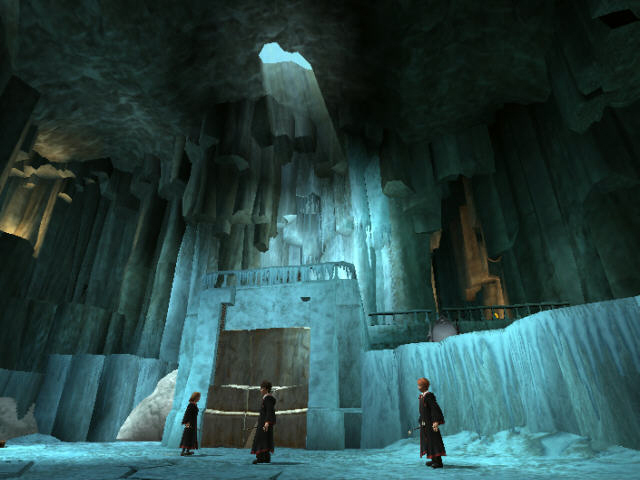 Like Chamber of Secrets, the game featured small themed puzzle dungeons that acted as ‘lessons’ set by the Hogwarts staff. My role in all of this as Lead Designer was to coordinate the structure of the story and along with designers Andy Kerridge and Richard Evans, design the various game elements (controls, spells, creatures, reward systems) and levels (including an even more fictionally accurate rendition of Hogwarts.) In the final months, this also included working on the game content itself, alongside our massive team of talented programmers, writing in the game’s own custom scripting language to control the logic behind the many conversations and gameplay scenarios that arose within our interactive Hogwarts. I wrote a lot of cut scenes and the challenge was always stripping them back to their bare essentials so they didn’t run too long or kill our animation team in the process. Eventually, after many months of the combined and concerted efforts of a huge and incredibly talented team of artists, programmers, designers, animators and audio folks, Harry Potter and the Prisoner of Azkaban hit its deadline and came out in Summer 2004 to coincide with the release of the movie.